The Eighth Judicial Administrative District was created in 1977 pursuant to O.C.G.A. §15-5-1 and includes the Cordele, Dublin, Middle, Ocmulgee and Oconee Judicial Circuits. The Eighth Judicial Administrative District Council is composed of the Superior Court Judges named from the circuits listed above and the senior Judges of the district. The District Council elects an Administrative Judge who is responsible for the assignment of judges, short and long term district plans, and court support services. The Administrative Judge serves both on the Executive Committee of the Council of Superior Court Judges and the Judicial Council of Georgia. the Superior and Juvenile Courts of the Eighth District. On behalf of Administrative Judge Donald W. Gillis, thank you for allowing us to serve you. 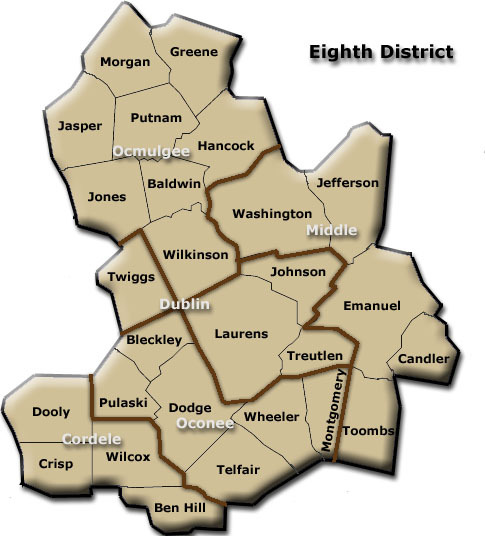 For more information or comments about your Eighth Judicial District Courts, please email this office at: bnadekow@eighthdistrict.org.